While speaking in front of the world’s largest police union — the International Association of Chiefs of Police — in Orlando, Florida, President Trump recently argued that police departments in cities like Chicago must implement “stop-and-frisk” policies to combat crime. Trump claims that while his lawyer – Rudy Giuliani – was mayor of New York City, stop-and-frisk successfully caused crime to drop. Unfortunately for Trump, data from the New York Police Department during this time shows that such policies made almost no impact whatsoever on crime rates. During this period, crime rates certainly declined in New York City. However, researchers found that the primarily causal link to this reduction in crime could likely be attributed to the number of patrol officers assigned to a given area, not the widespread use of stop-and-frisk. What is stop-and-frisk? The term is thrown around somewhat frequently, but — in general use, at least — it’s not terribly specific. It’s important to look back to the 1968 U.S. Supreme Court case Terry v. Ohio for a better understanding. In 1964, a police officer witnessed three men pacing outside a jewelry store while occasionally peering inside. The officer thought this was suspicious behavior and chose to approach them. After asking the men about their business and getting an inaudible reply, the officer then patted down one of the individuals, John Terry. On his person, the officer found an illegally concealed firearm; when he conducted a pat down on the others, another gun was discovered. The use of this evidence in the men’s trial was argued to be inadmissible by the defense because it violated the Fourth Amendment, which protects against unwarranted search and seizure. Eventually, this issue made its way to the U.S. Supreme Court where it was ultimately decided that the stop was constitutional — and the evidence permissible in court — because the involved officer had “reasonable suspicion” to justifiably stop and search Terry and the other men. Furthermore, the Supreme Court concluded that it would have been impractical to attempt to try to obtain a search warrant. This, however, did not necessarily open the doors to stop-and-frisk as a common and legal policing strategy. In 2013, a federal judge ruled that the New York Police Department had failed to conduct constitutional Terry stops. Instead of using on-the-street pat downs based on reasonable suspicion, NYPD officers were often conducting searches based largely on racial profiling. During the height of stop-and-frisk in New York City, from 2002 and 2013, hundreds of thousands of people were stopped every year. And 82 to 90 percent of the time, these individuals were innocent of any crime. Meanwhile, a disproportionate number of people stopped were either Latino — 29 to 33 percent of the time — or black –53 to 56 percent of the time. But data and facts have never stopped President Trump from trying to push his thinly veiled authoritarian policies in the United States. 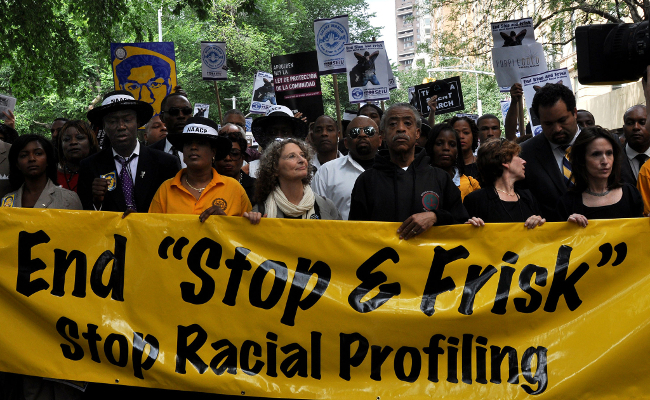 The return of unconstitutional use of stop-and-frisk in American cities must be stopped. The group Trump delivered his speech to, the International Association of Chiefs of Police, has previously acknowledged and apologized for historically mistreating people of color. Because stop-and-frisk involves returning to an inherently racist practice, it is the responsibility of the International Association of Chiefs of Police to reject this proposal. Add your name to this Care2 petition to urge the International Association of Chiefs of Police to denounce the unconstitutional use of stop-and-frisk! Mary, I just looked up your conceal and carry question. Some states are much more reluctant to give out conceal and carry permits than others. "Trump Urges Police to Reintroduce Worthless and Racist âStop-and-Friskâ Practices" works just as well if you start it with the words "Worthless Trump urges police..."
Lets see, how many of you didn't get this ? IT is OKAY to stop and frisk if the cop has a REASONABLE suspicion that something illegal is brewing. But it is NOT OKAY to do it for racial profiling. And isn't conceal and carry legal now days ? trump is following the example of the dictators he loves. Is his next step grabbing people off the street and imprisoning them indefinitely without a trial? And will the next step after that be people disappearing permanently? It has happened in other places, and under trump, it could happen here. As a person in a bi-cultural marriage, and the mother of two bi-cultural children, I find this deplorable. My husband and I were talking yesterday and I told him that unfortunately, I was now thankful our daughter got his brown skin and our son got my white skin. My son even thanked me for his skin color (like I had any control). People are less likely to harass my daughter than my son. It is sad that I even think along these lines now, as I didn't even consider it 26 years ago when I began dating a man who is Hispanic. I was raised to look at a person's personality as opposed to their skin color, and I taught my own children to do so. Unfortunately, I'm encountering more and more people who don't have a problem verbalizing their ignorance and prejudice, and our government condones this idiocy.